Welcome back to St. Isidore of Seville’s Etymologiae – specifically book 12, part I (about herd and pack animals). This week’s entry sees St. Isidore explain quadruped herd animals before moving on to differentiate herd animals from working animals. Let’s get straight to it! “They are called quadrupeds that walk on four feet: which are similar to herd animals save that they are not under human care; such as hinds, deer, wild donkeys, and others. But this does not include beasts like lions; nor pack animals, such as those humans may/can use like cattle. “We call all those lacking human languages and likenesses herds. On the other hand, strictly speaking, the name of a herd of such animals as those that are or could be used for food is called by this animal’s name alone, like sheep and pigs or those used for human convenience like horses and oxen. Paragraphs  and  are definitely about splitting hairs. But that’s Isidore’s business here, to try to differentiate between things so finely that his words only differ in their inflection on the page, subtle differences only really visible in their conjugation. The words that best exemplify this are “pecus, -oris,” meaning “cattle, herd, flock; animal,” and “pecus, -udis,” meaning “sheep, herd of cattle, beast.” Their genitive singular forms (the standard case for a dictionary headword) are clearly similar. But what really makes their similarity muddying is that when Isidore is describing the difference between herds and heads of animals he only defines one of his two categories. After all, he points out that herd animals “graze like sheep” (“eduntur, quasi pecuedes”) and then just implies that those that don’t are called by “heads of [animals]” (such as a head of cattle). It might be something that’s coming through as a result of translation, but it seems that Isidore is struggling to really make himself clear because he’s making such fine distinctions. But before I read too far into this sense of struggle, onto the next word. “Iuvenca, ae,” meaning “heifer, girl.” It’s probable that this word had a specific connotation when Latin was still spoken across the Roman Empire, but it’s still quite telling of Roman culture that the same word could refer to a girl and a heifer. Perhaps this second meaning wasn’t necessarily negative, but it’s difficult to see it as anything other than an insult of one sort or another. After all, such a connotation for “cow” is still present in Modern English; “cow” sometimes sits in for b@!$&h. See for yourself here. Also, my Latin dictionary lacks the heavy distinction that I hope might be present between the words “cervi” and “dammae” both of which can mean deer (cervi can also mean “hind” but a hind is just a specific sort of deer). Maybe I need to get a better dictionary, or maybe I just need to turn to my readers for a bit of aid. If you’ve got a way to split apart the words that seem too close to me, or want me to translate more of Isidore per entry let me know about it in a comment. And check back Thursday for Beowulf’s wrapping up of Hrethel’s woes in his informal history of the old king’s sons. Beowulf finishes his digression in this section and then returns to the specifics of Hreðel’s situation after the death of Herebeald. Here, read for yourself. Among the images used in the passage, I think that of the father who has no interest in producing another heir because his first born has been killed is the strongest. That image really speaks to the sort of despair and sense of futility that anyone within a hierarchical inheritance system would feel when, as the Old English word implies, one has lost their inheritance guardian (“yrfe-weard,” ll.2453). True, the man has his other sons to inherit his lands and property upon his death, but the death of the firstborn throws the identity of the heir into question. If mere birth order determines it then there could be a motive for the murder there. Hæðcyn could have possibly killed his older brother to jump ahead in line, thus marking him as dishonourable and selfish and thus a bad king. If it was just an accident then might Hæðcyn also be a bad choice because he lacks control? Yet simply handing the realm over to Hygelac and skipping Hæðcyn entirely would be a slight to him as the second eldest – and besides, who’s to say that the two didn’t conspire against Herebeald? The destruction of even a single link in the chain of inheritance throws the whole sequence into question. And I think that’s why Hreðel’s sorrow is described in terms that are similar to those used for the last survivor’s sorrow. Though he has sons and his line will continue, he may be the last one who can fully enjoy the legacy of his properties and lands. The first of these sections echoes the statement in line 2458 that the “fighters are laid down in darkness,” after some verbal acrobatics. The word used for “elsewhere” in line 2254 (“ellor”) is also used in a compound word meaning death (ellor-sīð) in reference to Herebeald. The death of the fighters in line 2458 is sheerly communicated via metaphor, but the idea of death being some ‘far country’ could be present in the mention of ‘darkness.’ Darkness was a very strong marker of the Other, and death is a great Other as well. The second section is more clearly related to Beowulf’s description of Hreðel’s sorrow in that the imagery is that of lack of music, emptiness in the hall, and silence in the yard. Essentially, spaces that were once filled – the air with sound, the hall with feasting, and the yard with motion – are now lacking these qualities. Just as the last survivor laments the loss of people who bear cups, polish armour, or use any of the treasures that he’s returning to the earth, so too is the lack of what defines these spaces useful as an expression of mourning. One who is integral to the regular function of life and society has been lost. Could there be more of a connection here? Does Beowulf perhaps look at the younger generation of Geats and think that he too is a last survivor? Is that why he uses similar imagery? Or was the poet/scribe just strapped for ideas? Narrowing my focus down to words that caught my eye, one that I would like to get back into everyday speech is “windgereste,” “resting place of the winds,” implying an empty or disused space. That whole phrase is a bit much (it’d take 26 characters out of any tweet! ), so instead it could be introduced as wind-place, or wind-dwelling, or wind-home. “Ellor-sīð” is also curious (meaning “journey elsewhere, death”), but ideas of death and dying are now so much broader than they were in the recorded West of the early middle ages. It’s a broad term, but I’m not sure if it would work given the acknowledged breadth of current ideas of death. “Yrfe-weard,” mentioned near the top of this entry, could work on the same level as “windgereste,” since inheritance still happens and wills can be sticky situations. However, inheritances don’t have the same general importance as they did then, since they aren’t the only (near) surefire way to a life of comfort/success/wealth. Whether it’d fly or not, “surety-heir” could work since surety is basically a term for a very specific kind of guard, and it does have a nice flow. What’s your preference among those three compound words for a new English word? Let me know in a comment! Next week, come on back for the continuation of St. Isidore’s entry on herd animals and beasts of burden, and for the completion of Hreðel’s part in Beowulf’s reminiscence. St. Isidore of Seville did not exactly organize his Etymologiae as I had expected. Rather than going animal by animal and offering a catalogue of facts, he instead set it out by category. That means that for the next few months I’ll be working through his explanation of “Herd Animals and Beasts of Burden” (“De Pecoribus et Iumentis”). Now, my translation. This is twice removed from the original text, since, it being prose rather than poetry, what’s below is a revision of my (somewhat liberal) literal translation. “Adam first imparted names on all of the animals, calling each by name from its present state and alike to the condition in which it naturally served. “But Gentiles also gave to each animal names from their own languages. But it was not from the Latin nor from the Greek nor from any of the barbarous tongues, rather man imparted those names in that language which was used by all before the flood, which is called Hebrew. But before I get into the first three verses of this book, a few words about St. Isidore, patron saint of the internet (according to Wikipedia), himself. He was born sometime in the latter half of the sixth century and died in 636 AD. Not much is known of his ear;y life, but his parents died while he was still young and so he was raised by his older brother, Leander, who had been prepared for a life in the Church. Leander followed this path to the bishopric of Seville and Isidore did the same, succeeding his brother as bishop around 600 AD. 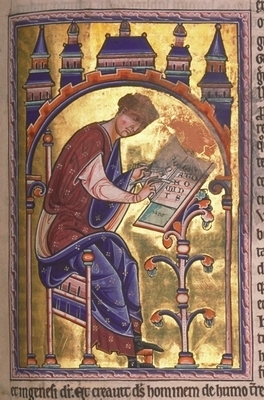 Isidore is famed for his writing, which covers a variety of topics ranging from the theological to the physical. If you want more information on Isidore, check out the Catholic Online and the Catholic Encyclopedia entries on him – but keep in mind these sites’ biases. This word constitutes a translational fork. On the one hand, Adam, or the more sweeping “man” imparted names to the animals, it was a benign act of giving of him/itself. On the other, those names were imposed, meaning that there was a degree of coercion or force involved. Humanity either gave the names freely or stamped them onto the animals, branding them all with words that forever represent each animal. And finally, things get rolling in verse three. Here the Latin words for animal and their meaning is given. I do wonder, though, if “spiritu” is the capital ‘s’ Spirit, or just a spirit or even just spirit. The redundancy in the original Latin offers a small clue. Since “spiritu” is paired with “vita,” which just means life, the most general meaning of “spiritu” seems like the best choice. So it must be “spirit,” as in “school spirit,” or in the sense of morale. The implication of using “spirit” is neat, too – that things are animated by a sense of purpose or basic drive. Also curious is that Latin and Greek are practically counted amongst the barbarous tongues. Latin was paramount in medieval education, and Greek, though lesser known during much of the middle ages, also held a fair amount of prestige. Placing them in in such close proximity with “barbarous tongues” that don’t even get named definitely sets Hebrew up as something special. Check back here Thursday for the continuing image of the mourning old man in Beowulf. And if you’ve got a preference for which “spirit” to go with or whether “indidit” should be translated as “impose” or “impart” let me know in a comment. Things take a turn in this passage (ll.2441-2449). Not from Hæðcyn’s sorrowful act, but from Beowulf’s direct retelling of his tale to his use of a peculiar simile. On lines 2444-46 he compares Hreðel’s sorrows to those of an old man who sees his young son hanging on the gallows (“‘Swā bið geōmorlīc gomelum ceorle/to gebīdanne, þæt his byre rīde/giong on galgan.”) He goes on to expand this image by explaining that the old man can only look on helplessly while the raven rejoices over his son’s corpse (“hrefne tō hrōðre” l.2448). This section of the poem (ll.2247-66) details how the one who originally left the dragon’s hoard must have felt, being the last of his people. It describes the futility of treasure without people to use it and with whom it can be shared. But it also emphasizes the importance of community to the Anglo-Saxons. As far as modernizations go, “heart-sad” sounds both poetic and syrupy at the same time, but “mind-worn” could work for a modernization, I think. It could express a feeling of being so overwhelmed by a task or emotion that your mind is sore; just as a muscle feels sore after it’s been worked out. “mind-tired” could also work, there’d be some internal rhyme that way. Although it only gets cursory mention here, a little bit of explanation of the raven in Old English lit is in order since I think it plays a larger role here. The raven is one of the three “Beasts of Battle” (along with the wolf and the eagle) and held many different meanings (check this site for a good deal of info). Just as they’re regarded as bad luck, or ill omens by some today, so too were ravens regarded before the 11th century. But some also associated the raven with victory or sacrifice, and in Old English another word for raven is wælceasega (“chooser of the slain”) linking the bird to the Valkyrie of Old Norse thought. Aside from the raven in Beowulf’s speech clearly being an ill-omen (Hreðel becomes despondent and the realm is soon threatened by war), I think that it can also be interpreted as a symbol of sacrifice. Herebeald wasn’t sacrificed in the same way that say, Iphigenia was (by Agamemnon, for a wind to get the Greeks to Troy), but his death could still be regarded as the sacrifice of an eldest son for lasting fame. Sacrifice is also likely at the fore of Beowulf’s mind at this point – perhaps it is even a cause of his being in such a heavy mood. He knows that he will die if he fights the dragon, but he also knows that doing so will win him fame, save his people, and land them a hefty amount of treasure. All three of these things are necessary for a good king, as established by Beowulf‘s opening with Scyld Scēfing. He won a great amount of fame, and of treasure and was able to use both to increase his people’s prosperity (ll.4-11). The treasure also helped his son to forge bonds and obligations with warriors who would fight for his right to succeed his father upon his death (ll.20-24). Within the situation that Beowulf describes, Herebeald can be read as a sacrifice not just for the fame of Hreðel, but also for the fame of Beowulf. After all, if Herebeald had lived he may have ruled well and been loved by all, giving Hæðcyn and then Hygelac no reason to rule, and thus leaving Beowulf without a kingship from which to launch his own fame. So Herebeald’s death is also a sacrifice for the betterment of posterity – even if that eventually leads to the destruction of his people. Next time, Beowulf continues to expand his comparison, detailing how the old man regards nothing in the same light again. If you’ve got a strong argument for “heart-sad,” “mind-worn,” or “mind-tired” as a new word; if there’s anything about Beowulf that you want to ask; or if there’s anything in the poem that you want to see given special attention, then please do leave a comment. “The time for flowers now is come, for the flowers now &nbsp&nbsparise. All things now are of the spring, nature’s likeness is in &nbsp&nbspall eyes. “The meadows are full of flowers now, as they start &nbsp&nbspappearing. Grasses, shoots both rising through, making winter turn &nbsp&nbspin. Spring growing stronger in due time, bringing renewed bird &nbsp&nbspdin. to whom we entrust all deeds whether they be bare or shod. Now we pray you renew the world fill our souls to the &nbsp&nbsprafters. Death and love we now do dignify absolutely. And with that, “Tempus Adest Floridum” is complete. 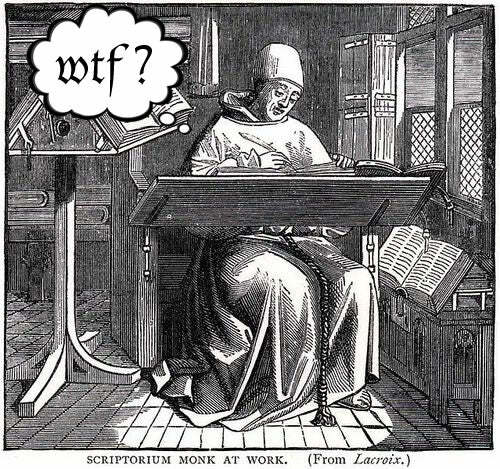 Now, it’s my intention to work on mostly medieval Latin on this blog and with that in mind I’ve decided to move on to an entry from Isidore of Seville‘s Etymologiae. The Etymologiae is the medieval world’s Wikipedia, essentially, an encyclopedia covering all fathomable topics. Of course, Isidore didn’t write it, but he did compile it – much like how the first edition of the Oxford English Dictionary wasn’t written by a single person or even a small group, but was an effort of an entire mass sending in slips of paper with words and meanings and uses. Because medieval bestiaries are often great fun, I’ll be translating a passage about an animal. Which animal, however, I’ll leave a mystery until next week. If you want to compliment my reciting voice, perhaps make a special request, or just drop a line, feel free to do so in the comments. This part of Beowulf is one that makes the Anglo-Saxon propensity for melancholic reflections painfully obvious. We see the old king sitting on the sea cliffs and talking with his thanes about his life, and how even at an early age he witnessed something tragic – fratricide. Lines 2430 to 2440 actually present a curious kind of contrast. In the first five lines Beowulf tells of Hreðel’s (Hrethel) warm reception (“mindful as kin,” “sibbe gemunde” (l.2431)). But then in the second, we get his report of the murder. According to Beowulf (no mean storyteller, he did, after all, boast to Hrothgar about his deeds, clear up the matter of the swim with Breca, and give Hygelac a slightly diverging story about his fights with the Grendels upon his return to Geatland) Hreðel’s eldest son, Herebeald, was shot and killed by the youngest, Hæðcyn (Haethcyn). Within his account, two things come up that I want to expand upon here. First is one of the brother’s names, and second is Beowulf’s phrasing. Perhaps a bit of Christian propaganda, Herebeald’s name echoes a similarly killed Aesir in Norse mythology. This Aesir is the son of Odin, Baldur, god of Light and Spring. For the full story of his death check here. The gist of it is that Baldur’s death is foretold, all of the things on the earth take an oath that they will not hurt Baldur, yet through some of Loki’s trickery and a technicality Hodor is given a sprig of mistletoe that did not take the oath. Hodor fires and Baldur is killed. This could be some low level Christian propaganda because it points towards fratricide within Nordic myth, thus attempting to show its wrong-headedness. However, Beowulf seems to be defending Hæðcyn. Here is how he describes Hæðcyn’s act: “he aimed for a misted mark and shot his own kin” (“miste mercelses ond his mǣg ofscēt” (l.2439)). Because this is a whole line and not just a word or phrase, I think that strategic language on the poet/scribe’s part for the sake of form can be ruled out. Within the phrase itself, all of the words are quite clear. “Miste,” “ond,” “his,” and “ofscēt” are all more or less left unchanged on their way into Modern English. “Mǣg” is less immediately clear, but translates as “kin, family.” Ah, but “mercelses,” that offers some difficulty. Knowing that the word is a form of “mearc” meaning “mark, sign, standard, border, etc.” means that it’s just a matter of figuring out its case. That it ends in “es” gives solid ground to say that it is indeed in the genitive case, which I expressed by adding in “aim” to clarify a more literal translation. Such a literal translation is: “mark of mist and his brother shot.” Since it’s mentioned that Hæðcyn has a bow in line 2437 (“bogan”), the logical step that must come between his having it and the mention of a “mark of mist” is that he must have been aiming his bow. Hence the addition. Though even without this addition, the emphasis that the line’s alliteration puts on “misty” suggests that Hæðcyn was in some sort of daze. I think that this ambiguity absolves him of the murder, in a way. it certainly makes it more ambiguous, and might even be pointing towards the moral idea that a person cannot be judged on their actions but only on their intent. Beowulf (and/or the poet/scribe) might just be unclear on what his motivation was, but there is a germ of something more here, I believe. Why? Because it’s coming in at a part of the larger story of Beowulf in which Beowulf is looking for solace in the sorrows of his past. Perhaps, some might argue that he is trying to forgive himself for killing Grendel whom he somehow viewed as a brother. Or perhaps he is just trying to work out his feelings for the Geats that he will be leaving behind through an analogy with Hreðel and the loss of his son. Beowulf has seen the Geats come far, but also has seen their youth lose their spark. Whatever the case is, the ambiguity presented here makes it plain that this whole episode is more opaque than evil dragons and troublesome killers. Next week the story continues, as Beowulf adds more detail to his tale – what becomes of Hæðcyn? Just how melancholic can Anglo-Saxon poetry get? Read on next week to find out! And if you’ve got any opinions, arguments, or points on or about this week’s section, toss them in the comments. Well, just as the winter of the song has wrapped up so too does the song itself now wrap up. This entry marks the final verse of the song “Tempus Adest Floridum” (which you can read in its entirety, in Latin, here). “The earth is ornamented by flowers and much beauty. We dignify by death and certainly loving. Having already worked through the previous three verses, this one gave me little trouble. Aside from a few words that I added to my vocabulary (honestis-dignify, maybe root of the verb sense of honour; pectoris-heart, mind, breast~I had to look it up because I had confused it with peccator, meaning sin; and iucundo, meaning pleasing or delightful), there was little that caused difficulty. But difficulty was still had. This time it came in the form of the last line of the verse. I know (and confirmed) that the suffix “que” means “and, both” and that sort of thing, but as far as I can tell there’s no other verb present in the sentence. Thus, I just unpacked “laudemus,” the result being “praise and laud.” It might not do for the literal translation, but there is something there for the more liberal version, I think. Speaking of the liberal version. A few changes were necessary throughout this verse to make the words more or less fit the melody and rhyme scheme. For example, “certainly” was replaced with “absolutely” in line two, and “voice” was subbed in for “depths” in line four. Replacing “time” with “season” is a little less egregious though – the two words are practically synonyms. If you think otherwise, however, or have something that you want to suggest, correct, or just plain comment on, feel free to do so in the comments below. Since that wraps up “Tempus Adest Floridum,” next week I’ll post a full, metrical and rhyming version of the song, my own performance of it, and an introduction to the next text. And, of course, that’s another thing that you can toss into a comment: a request for me to translate any text.